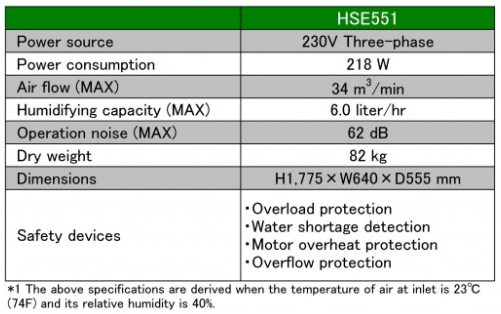 【SHIZUOKA SEIKI】HSE551 | Products （Vaporizer Type Humidifier ）| MASS CO., LTD.
Evaporative Humidifier is suitable for humidifying in industrial site, such as electronic component plant, printing plant, paint factory or plastic molding plant, etc. 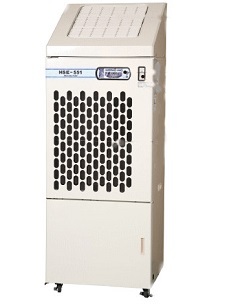 HSE551 has three step output. It’s humidifying capacity is 6 liter per hour with “High” output setting. Preferred output can be chosen from three steps in accordance with room size. HSE551 requires only power and water outlet. No need large-scale installation. This equips wheels and It’s easy to move or relocate the unit when not in use. In addition, HSE551 equips self-cleaning system. Just press the maintenance button once a month for cleaning inside of the unit.